Get a load of this fun group! 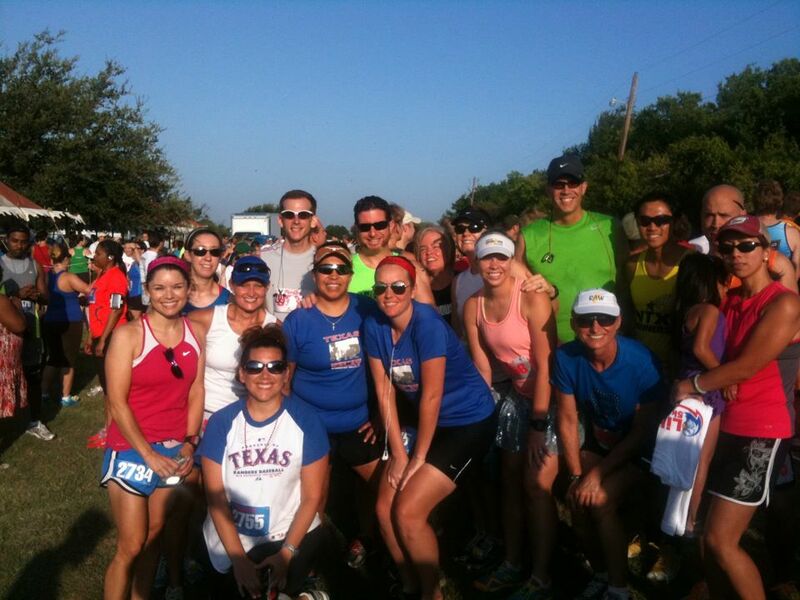 Pre-race snapshot — before the heat really kicked in — July 4 at Liberty By The Lake in The Colony. The last 10-plus days have been incredible. There's just too much I could blog about; I'll hit on two highlights and, of course, give ya a bit of randomness (at the end). If you're like me, by the time July 4 rolled around on Wednesday, you probably had seen some fireworks, listened to patriotic music, watched a parade, and spent time with friends and family the previous weekend. It's hard not to; my best guesstimate (subtract 5, divided by 7, carry the 1, to the third power) puts the Dallas-Fort Worth area's Independence Day celebrations total at 57,139. No complaints here. They all offer special ways to celebrate our country, and I had the good fortune to attend a few. 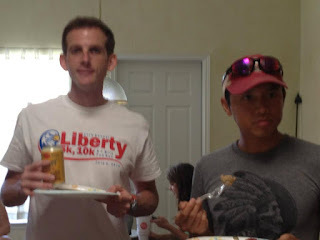 One even offered racing — Liberty By The Lake in The Colony. 'candid stuffing your face shot.'" Ninja's look? Caught! The race was OK — my first 10K, so guaranteed PR. The 10K course was mostly on a trail along Lewisville Lake, which was a new racing experience for me. I also left my fuel belt at home, opting to carry a handheld bottle. ("Hey, it's only a 10K, how much water will I need?") With the temperature in the 80s and little shade, that wasn't the best idea. I finished in 53:06 and felt good about starting the day racing. I certainly have room for improvement, and I will improve. Despite the heat, I would gladly run LBTL again. BUT, the real highlight of the morning: eating post-race waffles and hanging out with Frunners. It's impossible to have a bad time with good friends and food (Gracias, Team K for the hospitality). Oh, and there was Shiner, too (the official beer of Tr13ce). The little Spoetzl Brewery was a hot topic pre- and post-race. Well known for its beer and bike ride (G.A.S.P. ), the brewery will have its Inaugural Shiner Beer Run Half Marathon and 5K on Dec. 12. The Dallas Marathon is Dec. 9, so I'll have to miss the Beer Run. Looks like it could be a good time. More adventures are on the horizon, in particular some camping and hiking excursions at state parks. The first adventure: shopping at REI's Dallas store. You will not find a single venomous reptile or poisonous plant in this store (that I know of). However, winding through each section of the store can be exceedingly treacherous — there's just so much great stuff and most of it costs serious coin. As you pass all these badass items, it's really easy to justify your needing them, price tags be damned. Knowing all this and with a clear goal of upgrading to a multi-day backpack, I made a bee line to that section where I met Bob. First, let me tell you this: Bobs/Roberts tend to get along; in fact, I can think of only one exception to the rule. But, yeah, REI Bob, well, he's friggin' awesome. You'll recognize him as the 6-foot-8 fellow with white hair and beard. Can't miss him. Super helpful and knowledgeable, he helped me with six packs (a mix of REI brand, Deuter, Gregory and Osprey). Sure, I researched plenty online, but nothing compares to excellent, expert customer service. Bob helped with the fit, loaded each pack with about 20 pounds of sand bags and told me to walk up-down-and-around the store. I probably definitely looked strange, but it was an important exercise to rate each pack's weight (ounces matter, folks), cushioning, hipbelt and overall fit. If I hadn't done that, I definitely would have purchased what looked good online, and that would have been a big mistake. The ones I liked online cost a bit less but fit poorly. In the end, I picked up the Osprey Kestrel 68, which has everything I was looking for: ample storage, water reservoir compartment, ridiculously light and should be comfy for long hiking. If it's not, my REI membership allows me to bring it back for a replacement — among the many perks $20 will get ya (much more than just free rockwall climbing, which is nice, too). Across from NorthPark Center in Dallas, there's a shopping center called Lincoln Park. It has a Blue Mesa, The Container Store, University of Texas Co-op, Barnes & Noble, Tom Thumb ... and, now, two businesses, that, when paired together, make Yogurtland the odd biz out (unless you've got the munchies). I know, I know, neither Up In Smoke nor The Joint is a head shop, but I couldn't help chuckling at these two being so close to each other. I also entertained myself trying to create a new, assimilative name for the froyo sto': THCBY? Any other thoughts? State parks are a great way to see and enjoy the wondrous bounty of Texas that we often take for granted, or just never see in the city. What a great way to get away and reconnect with nature! And yes, having the right gear can make all the difference!